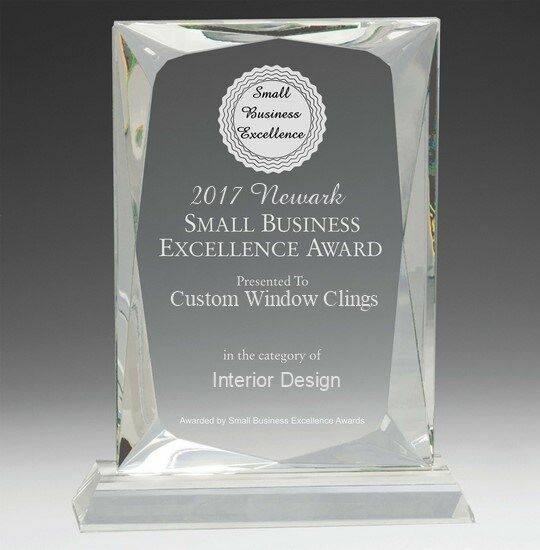 One of G1 Graphics online brands, Custom Window Clings (www.CustomWindowClings.com) was awarded the Newark Small Business Excellence Award, in the category of Interior Design. The award recognized outstanding small businesses that serve the Newark Area. Recognition is given to those companies that have shown the ability to use their best practices and implemented programs to generate competitive advantages and long-term value. These are small businesses that enhance the positive image of small business through service to their customers and our community. These exceptional companies help make the Newark area a vibrant and vital place to live. The Newark Small Business Excellence Awards was established to reward the best of small businesses in Newark. Our organization works exclusively with local business owners, trade groups, professional associations and other business advertising and marketing groups. Our mission is to award the small business community’s contributions to the U.S. economy.